Have you ever wanted the starter kit just because it’s a great deal? Would you love to save money on your crafting supplies? Are you looking for a way to earn some holiday cash? Would you love a way to earn extra income while having fun? 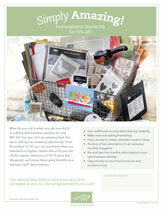 Do you love our Digital Scrapbook program and would love to get a discount on all your printing needs? If you answered YES to any of these questions then you need to contact me today. This is the best deal I’ve ever seen, now is the time. Time is short to contact me today. If you’ve been wanting to share what you love, earn a great income and make new friends, it has never been easier to do than now! From November 15 through November 30, 2010 new recruits can purchase the Standard or Digital+ Starter Kits for only $87.50–that is 50 percent off the regular price of $175 for over $310 worth of paper or digital crafting and business supplies! We encourage you to take advantage of this never-before-seen offer before it ends on November 30, 2010! The Simply Amazing Recruiting Promotion lasts from November 15 through November 30, 2010. Recruits can still add the Stampin’ Memories or Digital+ Add-On and will pay the regular add-on price. Recruits who join during the Simply Amazing Recruiting Promotion are still eligible for any programs available to a new recruit. This includes but is not limited to the extra 10 percent Instant Income offer, Stampin’ Start, the opportunity to purchase a Business Booster Kit, and a free two-month Demonstrator Business Web Services (DBWS) subscription. Click here to down-load the file with all the details. Click here to learn more about joining my team and how to get started. Contact me today for more information and to get started making your dreams come true. Come to my down-line meeting. Friday November 19th at 6:30 PM. We will be making some fun holiday projects so plan now to come. Please RSVP so I can have projects ready for you.